Like all nuclear propulsion concepts, the Rubbia engine (see Section 7.13) is not planned to fission whilst in the atmosphere. The dose to the public would be the highest in a hypothetical accidental re-entry, for instance at the end of a Mars mission. For each kilogram of americium loaded, the total collective dose committed for the following 250 years is estimated at 9.5 man Sv. The individual dose commitment over the following 250 years would be 1.8 x 10 ~6mSv. In the case of an americium stockpile of 15 kg, typical of a manned Mars mission using the Rubbia engine, the total collective dose committed for the first 250 years would be 140manSv, while the individual value would be 3 x 10~5mSv [Rubbia, 2000]. 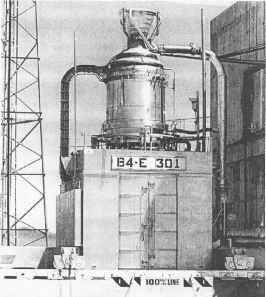 In addition, the fuel considered in the Rubbia engine (Am-242m) was purposely chosen because of its neutron cross-section sharply decreasing with temperature. This feature means that any runaway fission in Am-242m would automatically stop above a certain temperature, and the reactor regime would be brought back to a stable state.